Black and white greek themed Moustache Badge. 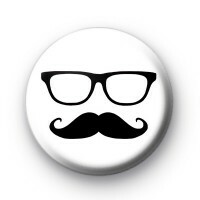 This bold design has a classic pair of spectacles and a very distinguished moustache. We have a great range of Moustache/tash badges in the shop, many of them have cool patterns and bold prints so be sure to check them out. Ideal for any Movember charity fundraising efforts. 25mm badge made from metal and plastic with a copper pin.